Here you'll find special events for Vision First Foundation. 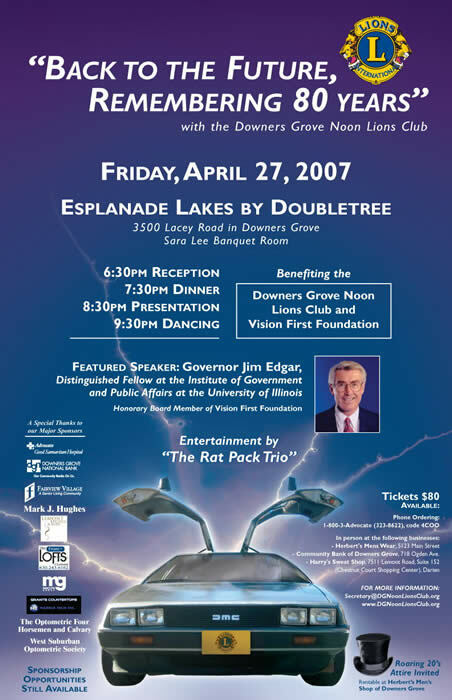 Vision First joined the Downers Grove Noon Lions Club in celebrating 80 years of community service on April 27, 2007. 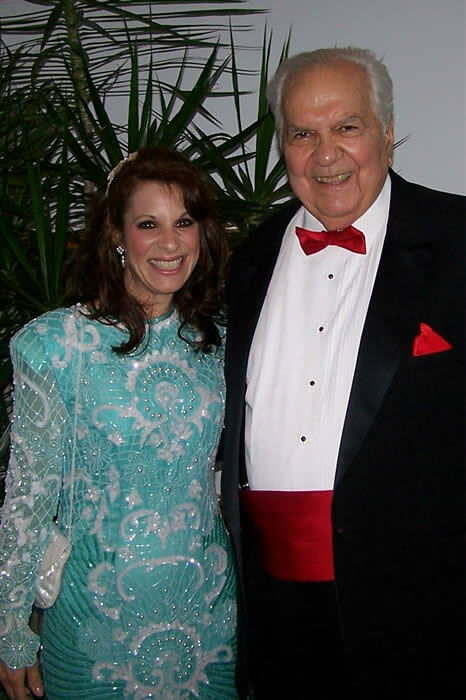 As the first benefit for Vision First Foundation, it was a huge success. Former Illinois Governor and Vision First Honorary Board Member Jim Edgar was featured as the keynote speaker. He received a standing ovation during his welcome. An entertaining speech ended in his sharing of a personal story of how he witnessed the worst student in the school turn into the best student the next year. All because the child received an eye exam and a pair of glasses. The event also included a souvenir program book. For an electronic copy, please contact us here. Special thanks to the following sponsors and guests: Read more... View fun pictures of the event here. “On behalf of Vision First Foundation, I want to thank President Harry Spatero and the Downers Grove Noon Lions Club for including Vision First in your 80th anniversary event. I applaud your Lions Club for the time and effort you have generously given to the community and to those with vision and hearing challenges over the past eight decades. I also want to thank Governor Jim Edgar for being a member of our Honorary Board and our keynote speaker tonight as well as all the successful businesses who have reached out to our community to become sponsors for this benefit. It’s people like you who truly make a difference in helping us achieve our goal of helping others. Vision First is dedicated to promoting “Amy’s Law” in our area and across the nation. Many children struggle in school because of undetected vision problems. Thank you for supporting our grassroots efforts and championing our cause. Congratulations and all the best for another eighty!" Mayor John Piazza and the Lemont Village Board for the “Mayor’s Annual Drive for Charity.” Vision First Foundation was a grateful recipient in 2006, 2007, 2008, and 2009. Kelly Schields, chair of the Festivals and Special Events Committee, and the Village of Lemont Public Works Department, for organizing a successful annual Heritage Fest. Vision First proudly participated in 2006 and 2007. The following Vision First volunteers made it a winning day selling almost 2,000 tickets for three moon jumps and slides: Janet Hughes; Pam Mikrut; Mike and Judy Mrozak; Joyce Schober; Rich and Nora Waliczek; Diane Waynick; and Gerri Yanku. Thank you for supporting Vision First Foundation. 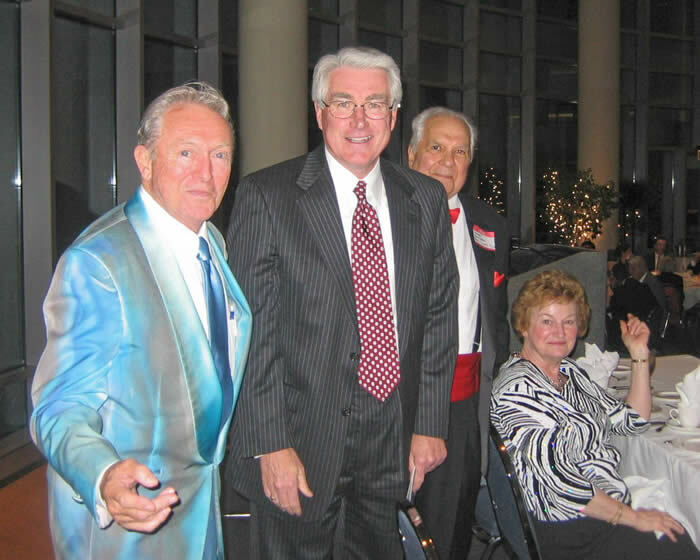 Dr. Floyd Mizener and Harry and Pat Spatero welcome former Governor Jim Edgar on April 27, 2007.